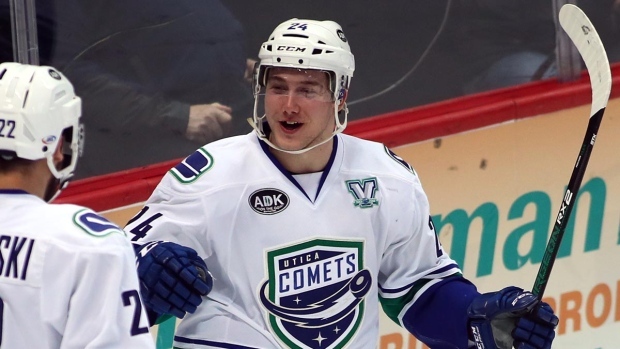 TORONTO — Reid Boucher scored two goals and set up another and the Utica Comets defeated the Toronto Marlies 7-4 on Saturday in American Hockey League action. Adam Gaudette had a goal and two assists for Utica (2-2-0) and Lukas Jasek, Tanner MacMaster, Brendan Woods and Darren Archibald rounded out the attack. Emerson Clark, Jeremy Bracco, Griffen Molino and Dmytro Timashov scored for the defending Calder Cup champion Marlies (1-3-0). Comets goaltender Ivan Kulbakov stopped 30 shots. Kasimir Kaskisuo started for Toronto and allowed six goals on 24 shots through 27:17. Jeff Glass stopped 10-of-11 attempts the rest of the way. Utica was 2 for 6 on the power play while the Marlies scored a goal on six chances with the man advantage.